The Touhou series has always been something of an oddity in Japan. Despite being based entirely on a series of bullet hell games created solely by ZUN, the popularity of the franchise was unrivaled in the country until only recently when a certain anthropomorphized warship game was released. 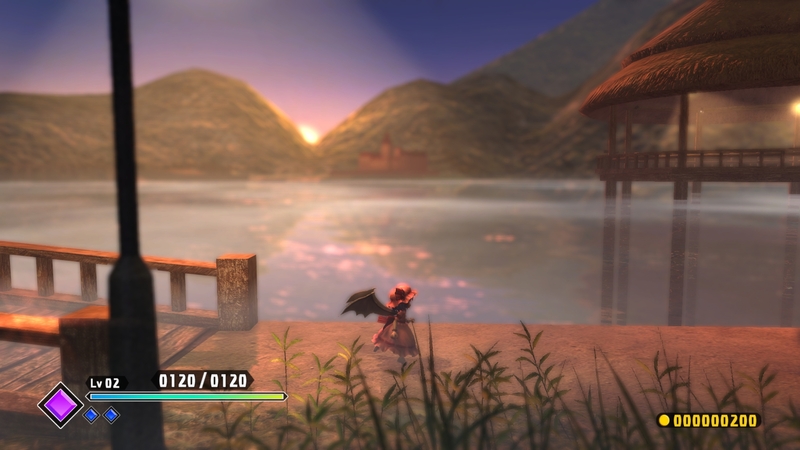 Thanks to this immense fan following, ZUN allowed numerous fan works to be developed including various spin-off titles. Despite this popularity in Japan that eventually leaked to the West, no Touhou titles were ever officially released in English until just recently in the form of fan games. XSEED Games has decided to bring over one such title in the form of the uniquely blended Touhou: Scarlet Curiosity to PlayStation 4 owners but is the game worth your time? 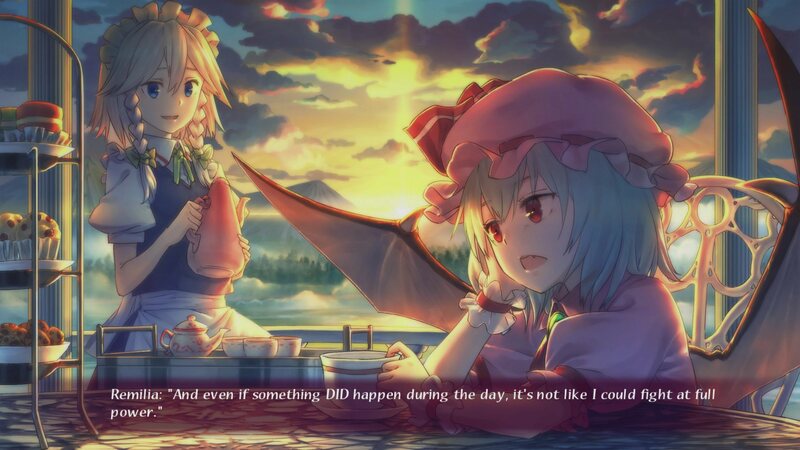 The story begins with Gensokyo’s 500 year old vampire Remilia Scarlet lamenting to her maid Sakuya Izayoi that she has grown incredibly bored. Despite having plenty of luxuries in her home, the Scarlet Devil Mansion, and numerous servants that serve under her, Remilia hasn’t had much to excite her lately. Bored with the standard everyday life she lives, Remilia hears rumors from Sakuya that a powerful and mysterious monster has been reported to have appeared in a nearby lake. In an effort to entertain herself, Remilia sets off to slay this creature, or if players choose to play as the powerful human maid Sakuya, investigate the rumors by visiting the lake itself. Regardless of who you choose to play as, since players are given the option of selecting between Sakuya or Remilia when starting a new game, the player arrives at the lake, defeats one of the Three Fairies of the Light who is there investigating as well, and then hears a loud commotion coming from the Scarlet Devil Mansion. Upon returning home, the mansion has been demolished and now has various low level youkai, fairies, and other beings roaming the grounds, though Remilia’s other servants are more than capable of holding her home base as a safe area. With her home in ruins, Remilia is even more excited at the turn of events and heads out to find out who destroyed her home and get some revenge at the same time. It is worth noting that this is far from the most nuanced storyline and even those who are familiar with Touhou lore won’t get too much extra out of the storyline compared to those that don’t. There are various characters that are referenced that never actually appear and certain popular characters appear as bosses or side-characters throughout the storyline but don’t expect too many special interactions to happen outside of a few funny interactions. This includes the labyrinth that players can unlock and play through in an effort to unlock the true ending which simply helps add a bit of extra action and wraps up the story in a more satisfying but still lacking way. As mentioned earlier, when starting the game players can choose to play as either Remilia or Sakuya and both of these characters have their own unique set of spells and skills that they can unlock throughout the game which plays in a rather unique way and often feels quite fresh thanks to the way things change up and the variety of skills players will unlock. 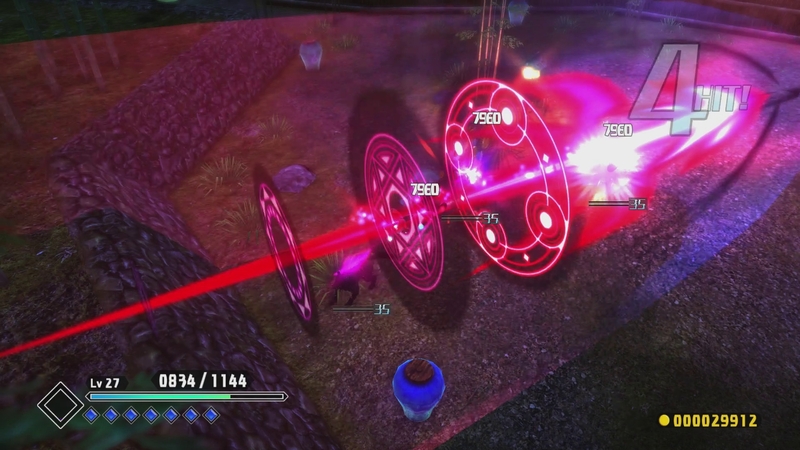 You see, players will be traveling through a dungeon set-up making use of hack-and-slash style combat systems with various spells and skills at their disposal when they wish to use them while also dodging or flat out attacking the enemy projectiles that make the game seem similar to its bullet hell origins at times. This means that players will often need to avoid various waves of glowing bullets being shot out in patterns that must be learned before either using skills to shoot at their enemies or simply getting in close to finish them off. Those who are unfamiliar with dodging shots will find that Touhou: Scarlet Curiosity can be rather forgiving since a death only brings players back to the beginning of a fight and usually the game is only really challenging during some boss battles. The gameplay is incredibly simple in nature and easy to master and there are various times when the pacing is broken up with a few different styled levels that allow for different kinds of exploration or bring the title into more of a side-scrolling brawler style than a dungeon crawling one. 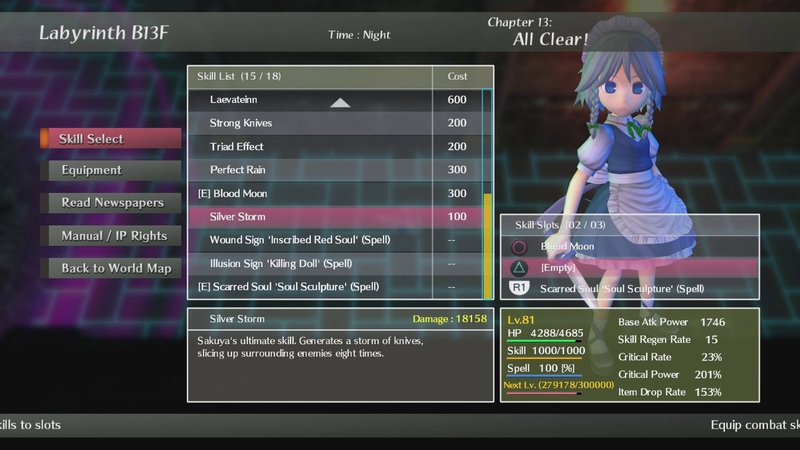 It is interesting to note that Touhou: Scarlet Curiosity still has roots in the RPG area as players will find that they will level up while fighting enemies and obtain various drops that serve as equipment. Unfortunately, the way items are handled in the game are incredibly cumbersome and annoying more often than not. Not only are most items given the same exact name, often picking up three items at the same time that are all called the same thing, but they all will have varying stats. This means players must sift through their inventory quite often to determine whether the tenth item they’ve picked up is as strong as the second they obtained with the same name. In fact, even the shops that crop up from time to time don’t even give players the ability to compare the items stats to their own since it is not possible to see the stats of equipment before buying it, making every purchase a gamble. It is worth noting that Touhou: Scarlet Curiosity is a fan game and therefore one cannot really expect the best graphics here and that is unfortunately something of the case here. While the game runs at a constant 60fps, the actual visuals are fairly simplistic in nature and even the character models, while designed to fit the standard depictions of each of the Touhou characters aren’t heavily detailed nor do they change in any way. Even the artwork representing these characters during dialogue scenes is middle of the road when it comes to Touhou fanart. Thankfully the title does sport a great sounding soundtrack featuring plenty of upbeat tunes that fit in well with the action. This is especially true when it comes to the boss battles that players will often be taking part in. It is worth noting that there is no voice acting of any kind in the game though. 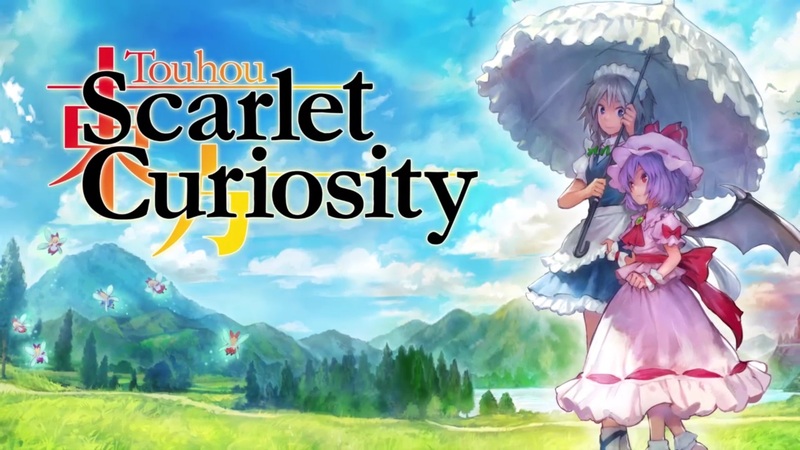 Touhou: Scarlet Curiosity doesn’t really impress too much outside of presenting a fun little action game that mixes together a handful of different genres into a satisfying enough game. The storyline doesn’t offer much in the way of enjoyment for fans of Touhou and newcomers will likely be fairly unfamiliar with most of the more humorous interactions outside of the obvious ones and while the combat works well, the inventory management is dreadful. That being said, this lighthearted action game still will be fairly enjoyable for fans of the series and those looking for something a bit different will find that Touhou: Scarlet Curiosity delivers that in a decent manner. 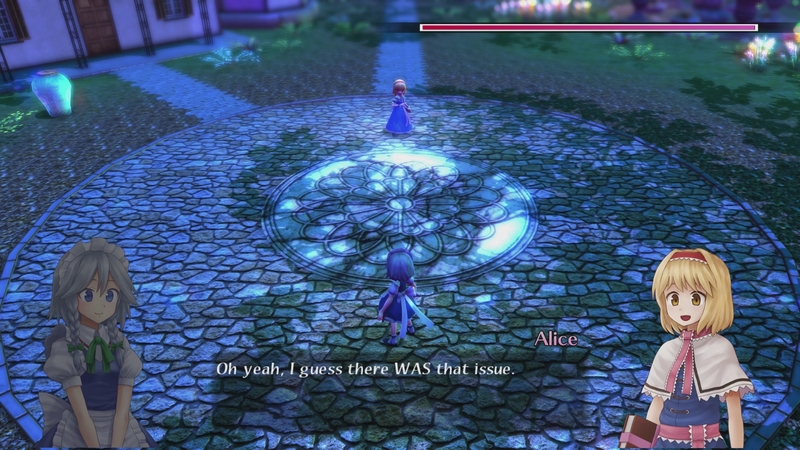 Touhou: Scarlet Curiosity combines bullet-hell style gameplay with action based combat and creates a unique feeling game with a simple story and a lack of polish that may satisfy diehard fans but leave others wanting a bit more.